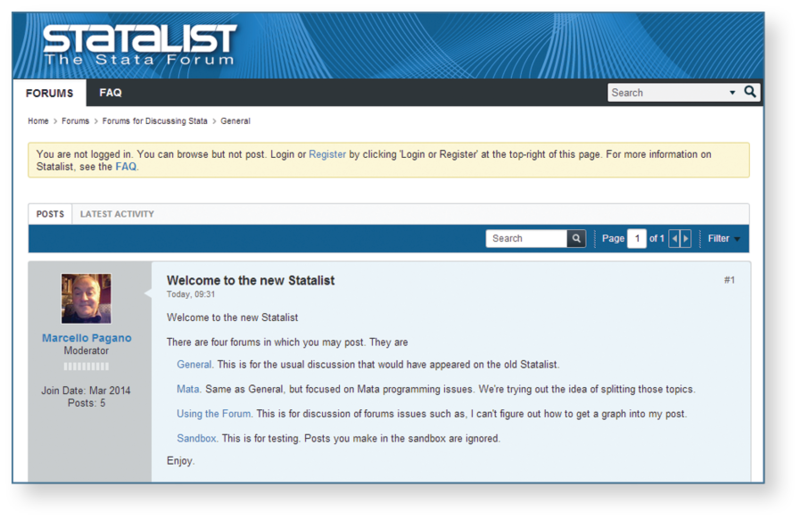 Statalist has now moved from its comfortable mailing-list format that it has worn the last 20 years to a new format. This should improve things tremendously because we will not only be able to transfer all the good things about Statalist, such as fantastic response and help from terrific listers, but also be able to post graphs, data, equations, etc. Plus, it is all on the web, so our mailboxes will not be filled by Statalist mailings and can now be dedicated to being notified about prizes won and bequeathments made by long-lost uncles who went to the ends of the world to make their fortune. One of the important reasons for the change was that Bill Mahoney—somebody most Statalisters don’t even know and who has been working in the background keeping the software and hardware going all these years—is about to retire. That plus the Sun workstation that has housed Statalist is turning 20 and in dog years, that is like 400 years, so it must be put out to pasture. So goodbye to Statalist@hsphsun2.harvard.edu, which will shut down at the end of May, and hello to statalist.org, which is now up and running. Go visit. Join, it is still free—no better bang for your buck—and you can continue to feast on Nick’s nuggets of wisdom. I will remain the moderator. A lot of work went on behind the scenes to make this happen. First, a committee was put together to argue design issues: Kit Baum, Maarten Buis, Nick Cox, Bill Gould, Phil Schumm, and myself. Then the hard work of implementation was carried out by Alan Riley and his crew: Kevin Crow, Pete Huckelba, and Annette Fett. Once you visit statalist.org, you will see what a terrific job they have done. So go try it out and learn to love it. As we said on the list, Statalist has a long history of helpful, constructive, and polite discussion. I expect to see that continue in the Statalist family. If you have never joined, go and take a peek.